Thanks for trying, Simon. I appreciate it. When I was 16 years old I had to go into hospital for some minor surgery and my father gave me Volume I of Simon Schama’s A History of Britain to keep me occupied before the operation. By the time I went up to Cambridge in 2003 the other two volumes had appeared on my shelf and Schama, with his poetic turn of phrase and optimistic neo-whiggery, rapidly became a hero of mine and I was pleased to make friends with a fellow undergraduate who agreed. This friend and I walked out of a supervision on Aristotle’s Politics a year into our course to see a poster advertising a talk by Schama in London, and so we quickly signed up for tickets and caught the train to King’s Cross. We listened to his talk before easing our way towards him at the post-lecture gathering wanting nothing more than a closer look. In the end we had a good ten-minute chat with him and his wife (who was overwhelmingly lovely – “can’t we adopt them, Simon?”). He won us over with his enthusiasm (“I love the 18th century” he told my friend to much delight). Fast-forward five years and I was in my first teaching post at Hinchingbrooke School in Huntingdon. In 2010, with the coalition government just elected, the curriculum review began in earnest, and I went to London to join a round-table discussion at the newly re-christened Department for Education, chaired by Simon Schama, on the future of the history curriculum. He was erudite as ever but rather ignorant of what happened in most history classrooms, but showed a real willingness to go and find out more which, to his credit, is exactly what he then went and did. A few months later and I had just begun my second teaching post, as Head of History at Cottenham Village College, when the headteacher grabbed me to say that a certain Professor Schama was coming to visit as part of the curriculum review. The only lesson available to be observed was my Year 10 class and, with more than a small whiff of irony, it was a lesson on the Third Reich. I should point out here that we tried very hard at Cottenham to avoid spending too much time on the Nazis: we did not teach this period of German history at Key Stage 3, but we did do it as one of the options for GCSE. Schama came to watch one of my lessons, on the consolidation of Hitler’s power in 1933 and 1934, and afterwards we went through our curriculum, showing the chronological and geographical breadth we aimed to achieve. Schama seemed impressed both at the knowledge of the pupils, the teaching that he saw (‘milk of the purest kind’, apparently!) and our overall approach to a balanced history curriculum. He said that he was struggling to find ‘bad’ history departments and that the message he was hearing again and again was that the main problem with history teaching in schools was the amount of time available on the timetable and the extent to which it was taught by subject specialists. This was, I think, the message he took back to the Department for Education. It was also the message that many others repeated: David Cannadine stood in front of Michael Gove at the launch of his book The Right Kind of History and made the same claim. 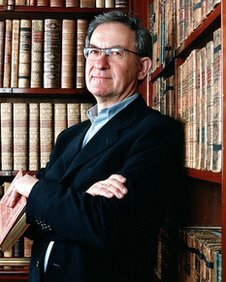 We heard little more, however, about Schama’s involvement in the curriculum reform process and one can best assume that this message – that history teaching would be be improved through more curriculum time, making it compulsory to 16 and with more specialist teachers – was not palatable to the education secretary. That was in 2011 and in the eighteen months that followed the ‘history wars’ that always accompany a curriculum review broke out with politicians, journalists and historians holding forth on ‘what should be on the curriculum’. That review is still ongoing though will hopefully soon come to an end. It was with much interest that I saw that Schama had decided to return to the issue of the history curriculum in his speech at the Hay Festival this year. I was pleased to see that his visit to Cottenham received a mention. Clearly the passage of time had had its effect; in his speech Schama recounted a whole hour on the Reichstag Fire when in fact this was one part of a lesson that had covered the period January 1933 to August 1934. Details aside, Schama revealed his anger, in so far as he is ever publicly angry, stressing once again his commitment to improving the provision of history in schools but lamenting the way in which the government went about it. He was especially critical of the draft curriculum released this year. I do not completely share Schama’s critique of the draft curriculum, and in any case we must await the final version before passing judgement. The aims section of the draft is very strong indeed, provided one overlooks a few cringe-worthy phrases such as ‘the achievements and follies of mankind’. I do not have a problem with the emphasis on British history as I think it is quite right that one should study, in some depth, the region of the world in which one lives. I also am not averse to the idea of a greater degree of specificity in terms of what should be taught: the aim of a National Curriculum is to set out a minimum entitlement, and too few pupils have received this in recent years, primarily due to history being squeezed in the timetable by other subjects or by schools introducing generic competency-based curricula such as the Opening Minds curriculum. The main problems with the draft as it stands, as numerous others have pointed out, concern the chronological break between primary and secondary school, the lack of non-English history and the fact that the draft suggests that the whole of history prior to the 18th century is best covered by a (most probably) non-specialist teacher in primary school. Even those teachers and historians who have been most supportive of Gove have struggled to endorse fully the draft curriculum on these issues. My hope is that they can be resolved in the final version. It does anger me, however, that this process was not managed better. It was a sensible political move to bring in someone like Schama to be the face of the history curriculum review: he’s well known and is most certainly not associated with the political right in the same way as, for example, David Starkey. Had the draft curriculum been thought through a little more clearly and had it been sold as a product of Schama’s consultation, then much of the fury that was unleashed by historians and history teachers might have been avoided. My feeling, from talking to many historians and history teachers over the last couple of years, is that there is actually a great deal of common ground and consensus upon which Gove might have drawn. I suspect that Schama’s (and Cannadine’s) message, that it was teaching time and specialism that caused problems, was ultimately not politically enticing as it did not provide Gove with a platform from which to make ‘sweeping’ curriculum changes. Like education secretaries before him, the curriculum is a powerful tool for winning political points at a relatively low cost; although frustrating, it would be wrong to blame a politician for being a politician; such is the price we must pay for democracy. I’ve always had the sense that Schama is an idealist and he was not the first idealist to have his views trumped by political expediency; he shall also not be the last. When all the dust has settled, however, I rather hope that it will be said that he did the right thing. So thanks for trying, Simon. I appreciate it.